Spinal deformity is becoming more common as adults in the 55 to 64 year age range are the fastest growing demographic in the United States. The treatment and management of these patients are becoming increasingly important as there is an elevated expectation for activity levels and function. You're listening to ReachMD. 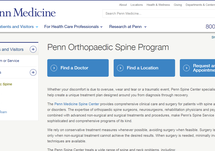 I'm Dr. Barry Mennen and with me today is Dr. Comron Saifi, Assistant Professor of Orthopedic Surgery, Division of Spine Surgery, at the Perelman School of Medicine at University of Pennsylvania. Welcome, Dr. Saifi. To start, help us understand the spectrum of spinal deformity that you see in practice so that our audience can get a better sense of this condition. Well, there's really two major demographics. So there's the pediatric patient population which I see. Typically these patients have an onset after age 10. And then there's the adult population that I see, and this is more common in the elderly, patient's above the age of 65, but certainly I see it in some that are younger than that. How common are spinal deformities and what kinds of impacts do they have on quality of life for patients? Well, in the adult population, there are two primary types of spinal deformity. The scoliosis, that I think most people are familiar with, and then there's another entity which is kyphosis, and that's when people kind of drift forward in their posture, so-called hunchback deformity. And those deformities, the ones where people are stooped forward, if you will, those have the highest impact on quality of life for these patients. There has been numerous studies demonstrating that these patients have significant back pain, simply due to their posture and correction of their posture, or improvement of their posture, can really have a significant impact on their quality of life. If I may, does this relate to osteoporosis and the vertebrae losing calcium? Yes, that's an excellent point. So that's considered a secondary cause of kyphosis. And osteoporosis, which can lead to compression fractures, cause kyphosis in many patients, and it's because in compression fractures the anterior portion of the vertebral body becomes compressed, but the posterior portion does not. And so that causes them to lean forward into a kyphotic deformity. The other subset, that's probably a minority of patients. The larger subset of patients are just having basic arthritic changes with loss of lumbar lordosis, and when they lose their lumbar lordosis, they then tend to drift into kyphosis over time. 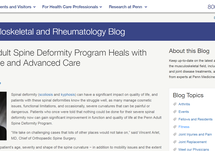 Now, what are the recommended imaging studies for patients with spinal deformity? Well, I think one area that is often overlooked, is that patients get just a small portion of their spine imaged, so they would get only a lumbar, typically imaging or x-rays, but we do whole-body imaging. You can do--most facilities are able to do--standing 36-inch imaging, which gives you an overall picture from C2 down to the pelvis. At Penn, we have what's called an EOS machine, which is a low-dose, full-body, imaging modality. It's akin to x-ray, but it has significantly less radiation, and this is important, particularly in our adolescent patients, so we typically get that. But it's important for someone who's working this up, particularly primary care folks, to be able to get the full standing x-rays to really make the diagnosis. That's an interesting point and something that I'll certainly consider in my practice now. Now, as an orthopedic surgeon, when are you typically brought into the loop for cases of spinal deformity? Is it a handoff from more conservative management to surgical management, or are you actually part of the non-surgical care plan? Yes. So, we have a parallel approach, so I'm involved in both aspects. So I do get patients who are referred to me for surgical management from our non-operative colleagues, but I also often see patients early on in the process, and I often recommend non-surgical management. So, we will often have patients who I don't think are in need of surgery and I will refer them to even physical therapy. There's a Schroth physical therapy which is a subset of physical therapy that is very good for our scoliosis patients. 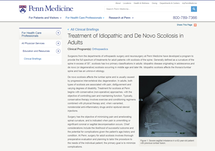 In particular, it's great for our adolescent idiopathic scoliosis patients. We've seen some really good results with Schroth physical therapy, so we will do that in some patients, and then in other patients who, you know, depending on their symptoms and their imaging, they may need more interventional measures. Sometimes these are even transforaminal epidural injections from my interventionalist colleagues. And then, obviously, our last stop is surgical management. If you're just joining us, you're listening to ReachMD. I'm your host, Dr. Barry Mennen, and I'm speaking with Dr. Comron Saifi. We're talking about treatment options for spinal deformities. Now let's shift to surgical management options. 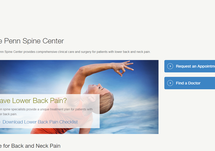 I am sure most of our audience is aware that there isn't just one way to approach spinal treatment surgically, but let's talk about some of the current options available, starting with minimally invasive approaches. So, yes, there are several minimally-invasive options that we do for adult spinal deformity and there is really a strict inclusion/exclusion criteria for minimally invasive treatment of spinal deformity. But if the patients meet that inclusion criteria, which really consists of patients with more moderate curves, then we're able to do XLIF interbodies, which are lateral lumbar interbody fusions which are a minimally invasive approach, in addition to ALIF which is anterior lumbar interbody fusion. And then, when we go to the posterior, we can just do percutaneous screw placement. So, to give you an overall idea, we would typically start with an anterior lumbar interbody approach from the abdomen for L5-S1 and then for L4-L5, we would close that. The patient would then go on their side. We would do XLIF, or lateral lumbar interbody fusion at L2-3 and L3-4. These are very small incisions that patients have very little pain from postoperatively. And then we would do instrumentation from the back, so the instrumentation is percutaneous. So the incisions for the screws are basically the size of the screw, less than a couple of centimeters, certainly, and we put the instrumentation in all percutaneously, so there's no open surgery at all for the posterior portion. And so the patients have much less pain postoperatively, are much more comfortable, and we have lower narcotic usage and shorter length of stay. So we do offer this to the patients who meet our criteria for this procedure. And the role of whole-spine imaging technology here, preoperatively and intraoperatively? So, preoperatively, as I mentioned before, we use EOS imaging and, in fact, University of Pennsylvania has now acquired an additional add-on technology for our whole-body imaging that allows us to create 3D models and 3D images from our 2D radiographs. And so these radiographs are from the occiput all the way down to the feet, and it gives us an overall understanding of the global, particularly the global sagittal alignment of the patient, so we can see when the patient compensates for the posture with knee flexion or hip extension, and in not just the lumbar or the thoracic spines, because really these deformities affect the entire body. Intraoperatively, in terms of imaging, we take full-length imaging during the surgery to confirm that our correction is exactly what we want it, and so that confirms that we've done everything we wanted to do, and then postoperatively, obviously, we follow the patient with a whole-body x-ray imaging as well. So that's very helpful. During the procedure, how do you monitor the patient? So, we monitor neurologic status closely with intraoperative monitoring with the assistance of an electrophysiologist who is involved in our cases. And there are placements of leads in the myotomes that correspond with the nerve roots and we can monitor our neurologic status of our patient throughout the case. So we do EMGs, both evoked and spontaneous EMG. Activity, we look at SSEP, so somatosensory evoked potentials. And then we always check for motor evoked potentials, and these are transcranial motor evoked potentials. And the rise, we actually just published a study, looking at intraoperative monitoring and the increase it has had in spine surgery and it's been significant, and it's for good reason. It really allows us to do these surgeries much safer, particularly when we do large spinal deformity cases that involve 3-column osteotomies. Now, you did speak earlier about some of the approaches, the surgical approaches, anything else to add in the area of spinal fusion and the various approaches? The approach is highly dependent on what the patient's specific pathology is. We have found that going from anterior supine approach for ALIF, so that's anterior lumbar interbody fusion, particularly at 5-1, allows us to really restore the patient's normal lordosis. The normal patient lordosis at L5-S1 is greater than all the other levels. It's typically around 24 degrees or so, and so this is where the patients need the greatest, usually the greatest increase in their lordosis, and we found that going from the front can accomplish this. Additionally, we will sometimes do posterior at this level as well, and do what we call a posterior column osteotomy, and that allows us to get even greater correction as well. In terms of from the sides, that's the lumbar lateral interbody fusion. This is typically done for the L2-L3 and L3-4 levels, and sometimes L4-L5 level. So it depends on the patient's specific pathology and if they're a candidate for minimally invasive deformity correction. So that's highly dependent on the pathology involved, but with all these tools we can accommodate each patient in a very specific manner, and do exactly what they need without doing anything more. Finally, on the surgical procedure, could you speak about bone grafting and implant considerations please? Bone grafting and implant considerations are part of the overall picture of fusion in a patient and there's several things to consider. We typically do use bone-grafting material, so bone allograft. We do, implants are typically either cobalt-chrome or titanium. That's become pretty much a standard. Many people have moved away from stainless steel. So we basically try to get the strongest construct possible based on the patient's body. One important consideration is that when we do a 3-column osteotomy, such as a vertebral column resection, or a pedicle subtraction osteotomy for patients who have a rigid deformity, because there's such bone resection involved, we do need to do often 3 or 4 rods. Typically we only do 2 rods, but in those patients, we do 3 or 4 rod constructs in order to help promote the fusion and allow the body a longer period of time to fuse, which is necessary given that there is a significant bony resection in those cases. And do you typically use the biologicals to speed healing? So, we try to minimize biologicals such as BMP-2. They are FDA approved for anterior lumbar interbody fusion. There's a good deal of research that does show that they are very helpful in spinal deformity. And so we will often use it in spinal deformity, but we do discuss the use with the patient very closely. It does increase the fusion rates, and particularly in individuals who have other risk factors for non-union, it's important to have that discussion. Speaking of that, what are the risk factors for postoperative surgical issues? So the risk factors are several. So for spinal deformity, I do get nicotine testing on all the patients preoperatively. It is a hard requirement that we do not operate on smokers for spinal deformity, and that is simply because the nicotine in smoking decreases the rate of fusion significantly. So I do nicotine testing on all of my patients preoperatively to ensure that they aren't smoking. That increases not only the rate of non-union, but also the rate of infection. In terms of medical conditions, diabetes certainly, and obesity certainly increase the rate of infection as well. So those are risk factors. And then, other risk factors to consider are medical issues such as pulmonary issues. So if our patients have a very significant curve, 90/100 degrees, or they have other pulmonary issues, we do get PFTs preoperatively. This could be a risk for delayed extubation postoperatively. Of course DVT and PE management is an important aspect postoperatively, and so we do make sure that if a patient has any sort of clotting or coagulation issues preoperatively, that they are seen by a hematologist and those are addressed preoperatively to minimize any risk postoperatively. What are the outcomes of operative management? So, there's a lot of good data on the treatment of sagittal malalignment with surgical management. And there's a couple of very good studies that have demonstrated that sagittal malalignment, the treatment of it, improves patient-reported outcomes. So these are validated clinical surveys such as SF-12 or ODI that have been studied. Others, a couple of well-known studies by Frank Schwab and Virginie Lafage, that demonstrate that patients who have sagittal malalignment have lower patient-reported outcomes, and surgical correction of their sagittal malalignment parameters improves their quality of life, based on these patient-reported outcomes. So I think that's pretty well established. In terms of coronal malalignment, the literature is still up and coming, but there is a recent ongoing study by some of the folks at WashU that was presented at a recent meeting that demonstrates that treatment of coronal malalignment scoliosis, in the adult population, does yield good clinical outcomes postoperatively. Then on the other side of the coin, in terms of pediatrics, our goal is not pain, it's prevention of progression of the curve. And so, we know that patients who have a curve of 45 degrees or 50 degrees, which is our surgical indication, will progress at approximately one degree per year for thoracic curves. And so the indication for treating an adolescent idiopathic scoliosis patient is really to prevent progression of the curve and to correct the deformity. So those are very different indications for surgery. Now, before we wrap up, Dr. Saifi, what research avenues are you currently exploring to advance treatment for spinal deformity? Well, we have several clinical studies currently underway and some of the more interesting ones include doing motion analysis for these patients preoperatively and postoperatively, to really hone in on their functional abilities and disabilities preoperatively, and to compare that to their postoperative functional abilities. So everything from their ability to walk, to walking up steps, to doing other activities of daily living, we're studying closely to see what areas we can improve and help them with on a functional level. Additionally, we do patient-reported outcomes for all of our patients who undergo surgery, and all of our patients who don't undergo surgery. They have PROMISE scores done in the clinic at every visit, so we track these numbers and see, on a more objective basis, how our nonoperative and our operative patients are doing over an extended period of time. My thanks to my guest, Dr. Comron Saifi, Assistant Professor of Orthopedic Surgery, Division of Spine Surgery at the Perelman School of Medicine at University of Pennsylvania, for a fascinating discussion of spinal deformity. Be sure to visit our website at ReachMD.com featuring podcasts of this and other series. I've been your host, Dr. Barry Mennen, and thank you for listening. You've been listening to Medical Breakthroughs from Penn Medicine. To download this podcast, or to access others in the series, please visit ReachMD.com/Penn, and visit Penn Physician Link, an exclusive program that helps referring physicians connect with Penn. Here you can find education resources, information about our expedited referral process, and communication tools. To learn more, visit www.PennMedicine.org/PhysicianLink. Thank you for listening. Orthopaedic Surgery Expert Dr. Comron Saifi reviews assessment and treatment options for spinal deformities. Spinal deformity places strain on the vertebrae and supporting muscles, tendons, ligaments, and tissues supporting the spinal column. The treatment and management of this condition becomes centrally important to maintain patient quality of life through functional mobility and activity levels. Host, Dr. Barry Mennen and Dr. Comron Saifi discuss the leading assessment and treatment options for spinal deformity. 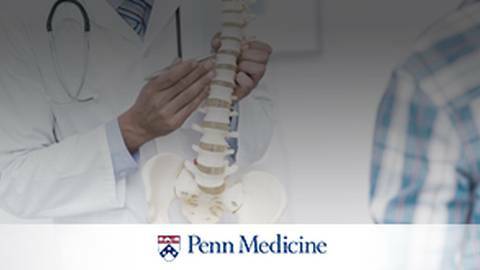 Dr. Saifi is an Assistant Professor of Orthopaedic Surgery in the Division of Spine Surgery at the Perelman School of Medicine at the University of Pennsylvania.